Birthday Auction 2017 - Misc. Once again Graceland Auctions are gearing up for Elvis' 2017 birthday celebrations. EPE note that "an amazing array of artifacts from both Elvis' theatrical and musical careers" are up for offer. The upcoming January 7 live "Auction at Graceland" event will also be in held in the new theater at the new Guest House at Graceland. With a plethora of authenticated artifacts to offer, they hope that you will find a treasure or two to interest you. 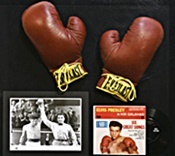 The auction includes the collection of "Rockin" Robin Roseaaen, whose nickname was given to her by Elvis himself, rings gifted by Elvis to Charlie Hodge, film-worn boxing gloves from Kid Galahad, personal clothing and much more! There is something for each and every collector!